A Campervan is a van that is equipped as a self contained travelling home. Campervans are normally smaller than Motorhomes. There is generally no divide between the cab and the living quarters. They usually have basic facilities for cooking, washing and sleeping. 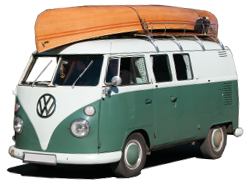 Like car insurance, Campervan Insurance is a legal requirement, insuring you against liability to others. It may also include cover your Campervan for accidental damage you cause depending on the policy you select. Third Party - Covers the essentials required by law, namely claims made against you by third parties for damage you caused. Third Party Fire & Theft - Same as Third party but includes additional cover for theft or fire damage to your Campervan. Comprehensive - Covers any damage to your Campervan or a third party vehicle or property damage as a result of an accident. Park your Campervan in a Garage or at least off road rather than outside the house. Remove all valuables from the Campervan when not in use.